Zona Saws are the standard to which all other razor saws are compared. These high quality, versatile US-made saws are suited for a wide range of applications: precision mitering of wood joints; construction of model structures, dollhouses, railroads, airplanes, ships and cars; flush cutting dowels and pegs, plastic modeling, and so much more. 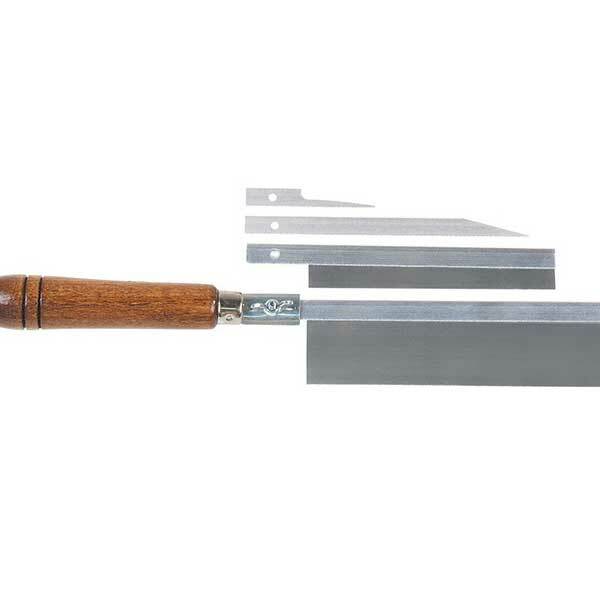 Multi-purpose Zona 4-in-1 Saw Set includes: one 32 tpi razor saw blade for cutting wood, one 52 tpi razor saw blade for cutting metal and plastic, two 24 tpi saber saw blades for curved cuts in wood (1 regular and 1 push-style keyhole type), and one finely finished 4 inch long wood handle with wing nut and screw for attaching blades (order extra blades separately).